296 bottle reefs line TRACC’s reef crest, plus 300 or so at the ribbon reef and another 60 are spattered around the island, at an average of 5 glass bottles per artificial reef, this means about 3280 glass bottles have been recycled as artificial reef material, not including the other bottle reefs used as building blocks in other structures. Add another 50 or 60 recycled tires, the plastic crate reefs, and about 10 HDPE structures such as the Igloos, Tipis, and the Swim through, and you’ve got a proverbial boatload of largely recycled material creating homes and habitats for sea creatures to thrive. 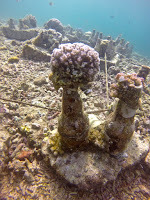 However, the artificial reefs not only provide different niches of habitat and attract fantastic biodiversity, they also provide structural integrity to the island ecosystem. A healthy reef crest stabilizes the slope of the reef, which in turn prevents erosion. Structural stabilization of the reef slope is important because it prevents the coral rubble from sliding down thus minimizing the available habitat of the shallow intertidal zone and lagoon, which is important for larval fish, as well as many other shallow water loving creatures – such as the blue ringed octopus. Additionally, it prevents erosion of the beach through causing the waves to break on the reef crest before they reach the beach, minimizing the overall erosion of the island. 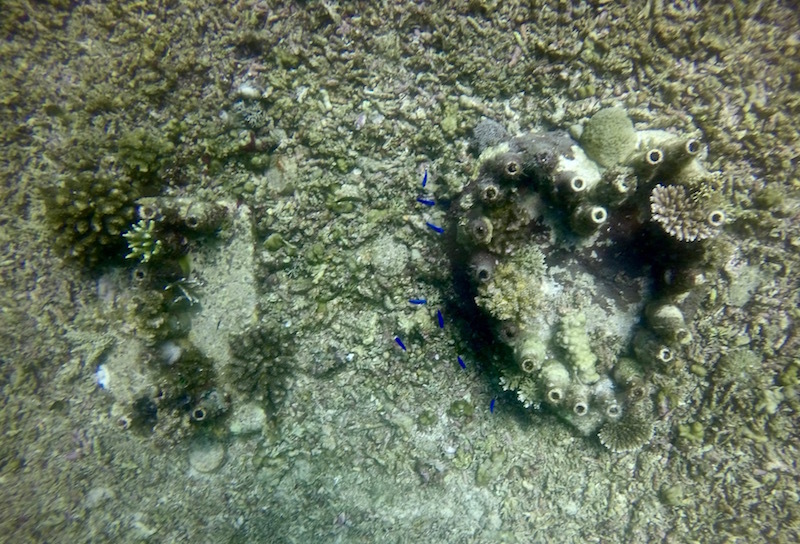 Long term consequences of a reef crest that is not stabilized include an altered ecosystem resulting from the loss of the beach surrounding Pom Pom Island. Without beach, there is no place for the rather particular turtles who prefer to come to the same beach throughout their whole very long life to nest. Without a place to nest, there is a big possibility turtle populations’ could plummet. As a keystone species, turtles have a high impact on keeping the whole island ecosystem balanced. For instance, Hawksbill Turtles eat sponges, because sponges filter nutrients, they are integral to keeping the waters nutrient concentration in balance. 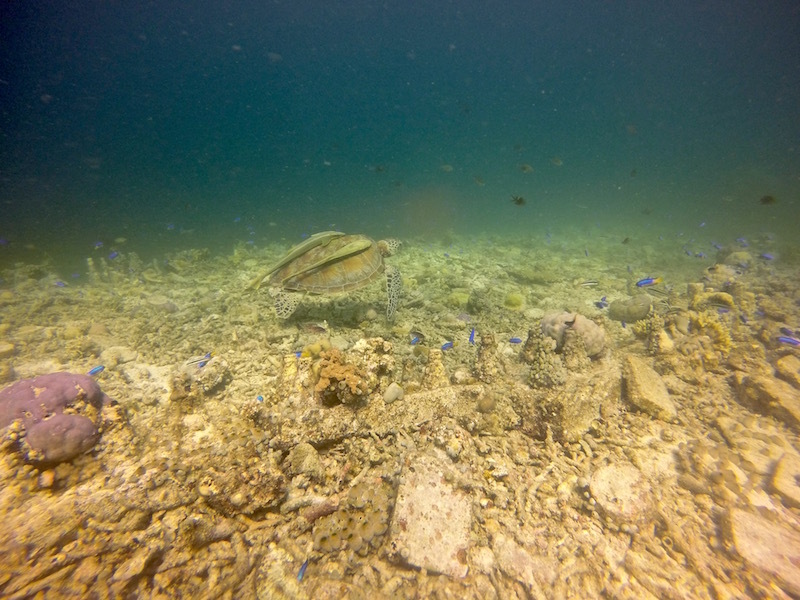 Without a balanced population of turtles to keep the sponges at the right level, there could either be too many nutrients resulting in algae blooms, or too little resulting in a lack of food for other sea creatures, and a total shift in the food chain, which would likely result in the loss of not only Turtles, but an overall reduction in biodiversity. 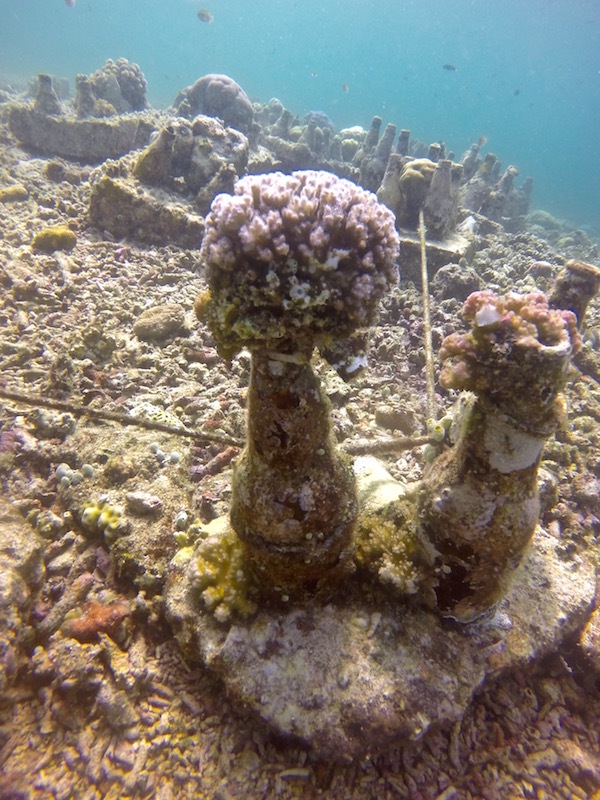 3000 bottles, some cement, and a bit of hard work – what a difference it can make in helping ensure a holistically healthy ecosystem full of bustling biodiversity and fantastic diving. and coralreefcare.com who generously provided materials to build the new reefs.